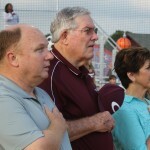 Dr. Jim Gardner, who played on Central High’s first baseball team in 1951, was on hand last Saturday to inaugurate the new lighting system at The Rock, the Central High baseball field. The event was the first Central High Alumni game, and it represented the first time in the 63-year history of Central High baseball that the Wildcats had played a home game under the lights. For Dr. Gardner, who is president of the Central Community School Board, it was a gratifying moment. The new baseball lights are only one of a host of capital improvements completed under the current school board. Members of the Central Community School Board are nearing completion of their four-year term and taking stock of the board’s accomplishments. One of the most significant was the $55 million Central School Complex on Sullivan Road. Even more important is the fact that the Central school district now has an A rating from the Louisiana Department of Education. Last year, Central High students ranked No. 2 in the state in ACT scores. The board proposed and voters approved construction of a Ninth Grade Academy on the grounds of Central High School. The board also acquired the old Greenwell Springs Hospital, which could be used as the site for a new high school at some point in the future. The board authorized demolition of the old Central Middle School at Hooper and Sullivan roads and it is now underway. Central schools have been extensively renovated to comply with Life Safety requirements. • A General Fund balance of $10 million to $11 million has been maintained. • Spring 2011 saw new bleachers for baseball and softball fields at Central High. • Summer 2012 saw comprehensive drainage improvements at Wildcat Stadium. • August 2012, a new Middle School facility and new Intermediate Elementary School facility completed for students and staff with a capacity of 2,400 students. • In January 2013, all Central Office operations were relocated to the former Starkey Academy site on Joor Road. • Spring 2013 construction of new staging area for parent drop-off at Central Intermediate School. • November 2013 voters approved an additional $13.1 million in bonds for capital improvement projects, without increasing taxes, by of a margin of 59 percent in favor to 41 percent opposed. • Spring 2014 all elementary schools had new playground equipment installed. The equipment was paid for by school fundraisers, Cooking in Central proceeds, and school board general fund monies. • In the Spring of 2014, lighting at the baseball and softball fields was contracted out for Central High School. That project was completed in early June. • Through legislative action, the school system was able to acquire the 160 acres on which the Greenwell Springs Hospital was situated. • Student enrollment has increased from 4,100 students to an estimated 4,500+ students for the 2014-2015 School Year. • Transportation upgrades have included air conditioning all elementary buses and video camera on all buses. • All schools have attained either an “A” or “B” letter grade since 2012. • The district has continued to receive an “A” rating despite changes in the state’s scoring system that lowered scores overall for districts. • Asbestos abatement began late spring 2014 at the former Central Middle site. • Front Driveway improvements at Central High School began in late May 2014. • The school system will incorporate a One-to-One Laptop Program into the schools for students in Grades 6-12. This will provide access to technology resources for all students in these grades to prepare them for an ever-changing workforce.